Kyoto is a city where more than 2,000 overseas students and scholars have stayed and visited from all over the world. The House was the first dormitory for overseas students in Kyoto. It was established at Shogoin, Sakyo ward, Kyoto city, in 1965 and, at that time, the government did not adapt a policy for overseas students adequately. 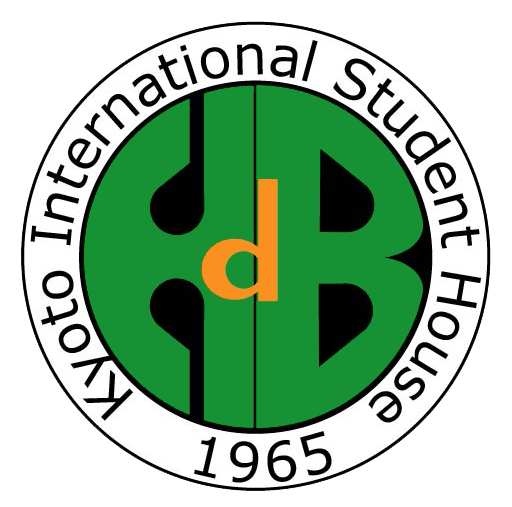 Kyoto International Students House Foundation has promoted international student exchange since the House was established. The late Werner Kohler (Professor of theology of Doshisha University and the Johannes Gutenberg University of Mainz) visited Japan as a representative of the Swiss East Asia Mission and elaborated the concept of “House of Meeting” through his community experience with Japanese students for five years. Activists of the world voluntary social service in Switzerland (Brot fur Bruder) and civil benevolent people including the late Hiroshi Inagaki, a professor emeritus of Kyoto University, have vouched for and asserted the concept. In honoring their devoted efforts, the Kyoto International Students House Foundation was established. Our objective is to promote international understanding and amity. We provide students studying in Kyoto from all over the world with not only life support, but also a dormitory as a living place and opportunities for daily activities, monthly and yearly events. We achieve our objective through having students to experience life in these opportunities. This objective is to honor the idea of “Community Life” advocated by Dr. Kohler’s idea “Community Life” does not mean superficial harmonious relationships. There are a lot of disagreement that are race, religion, custom, culture and ideology and so on between nations or nationalities. “Community Life” is the experience of “meeting (Begegnung)” as an individual person after admitting these differences amongst residents with other residents. We believe that it is an effective measure for the fulfillment of peaceful co-existence desired by mankind in order to acquire tolerance through strict experience and effort of admitting and recognizing their differences in each other. After the “meeting”, and we aim to realize “Community Life” under the “House of Meeting”, “Haus der Begegnung(HdB)”. After the Cold War the world faces new tensions caused by conflicts of not between the East and the West, but of an ideology such as nationality and religion. Moreover there is a problem underpinning these tensions and that is the environmental problems arising from the relationships between “mankind” and “nature” The environmental problems are related to the conflict of ideology, and have become the most radical point of rivalry causing North-South divide. Conflicts at the age of the Cold War have influenced the conflicts caused by “nationality”, “religion” and “environment”, but it is essentially the continuation of the conflict of ideology that has the most influence on the conflicts caused by differences in nationalities, religions, and environments. Over ideology of “nationality” and “religion” we need an idea to resolve the conflict. It seems that the idea is brought about by the “truth” derived from the dismissal and creation of self-viewpoint established through understanding reciprocal opinions expressed freely. Even if the truth is a harvest of various political compromises, individuals should search for the “truth”, otherwise resolution by compromises may bring us new conflicts. We should seek for the “truth” from listening reciprocal opinions and creating own individual standpoint. Therefore, the “Community Life” and discretion are necessary for the purpose. Thus the House, in an experimental sense, is established. Mutual understanding and tolerance in a new way are essential for co-existing, and our idea of “meeting” become increasingly important. Japanese family resides in the House as volunteers, they help “meeting” between foreign students and Japanese students. The family tries to remove various issues between students living together through the Common Meal, a dinner party that residents prepare and enjoy, and the House Meeting. There is no other dormitories for overseas students in Japan such as the ones offered by the House, where Japanese students account for a third. We hold many social events in the House, for example, seminars about various international problems, and International Food Festival, which introduces many kinds of dishes and promotes interactions between residents and citizens. The House becomes the place of international interaction and exchanges including not only students but also citizens. These international activities have been recognized by us winng “The Prize for Global Citizenship” by The Japan Foundation on 1985 and “The Prize of Developing Kyoto for the Future”, which memorializes 114th anniversary of Kyoto city government on 2012, for our contributions to international exchanging with overseas students in Kyoto. Our Foundation has received contributions from citizens, and in addition, Kyoto city and Prefecture. There are 903 people from 79 countries; 2,826 people scholars from 91 countries in the House; and they have flourished and have been very successful all over the world. In 2000, after 20 years since the establishment of the House, the House faced some crises of being shut down, separation from Swiss East Asia Mission, problem of decrepitude and disaster preventions. However, owing to so much fund-raising we were able to recover, and we will be able to celebrate our 50th anniversary, which is approaching. On 2008 a new law about corporation institution was established and Kyoto International Students House Foundation will apply to shift. We will make a new start on April, 2013, as the Public Interest Incorporated Foundation. This “home” was built for freedom. All who lives in this “home” shall express something important for themselves by words. Each people shall be as they are. And, they should endeavor to do it. That is a freedom of “Community life.” And, it should be added that the other important thing for them is to strive to make the others listen to what they have to say. In particular, the essential attitude is to pay attention to each other and to support the others. If they do not express by their words freely and not pay attention to the others’ words, you will fall into an inconvenient life. That is a renewed preparation for the abandonment of their　own “viewpoint.” To be free is a repetition of development and evacuation. The future of the “community life” depends on the freedom. The freedom is also new task for us to solve. It ought not to be allowed that they live together without making an attempt at confronting with each other for the freedom and by the freedom in this “home.” What we should fight for freedom is not to pursuit some ideology, religion and philosophy, which already exist, but to prepare to pursuit just the truth. We are convinced that the truth suffices all the other things. However, it does not mean that everything can be defined as being the truth or what is good or bad or not. What is truth? What is virtue? That should be judged when we open our own eyes widely. There are brightness and darkness, good life and bad life, love and hatred, peace and war, justice and injustice. To be believed in what is the truth or to walk on the road to the freedom mean one of the decisions. Therefore, the “community life” means not a present harmonic co-existence, but certainly a continuance of confrontation and tension. We must tolerate an impact that may threaten our daily lifestyle, because a real war that we must also face is the dilemma of what is not common and to decide whether it is humanly meaningful or not. The “community life” is still developing in its quest to acquire a proof of existence for our future and determine the human community in order to resolve this problem. Dedication Ceremony of Kyoto International Students House (April 10th, 1965) A kickoff party was held in Miyako Hotel on November 19th, 1961, and the incorporated foundation decided to be organized in Research Institute for Production Development. Then, the foundation of “Kyoto International Students House” was allowed to be established, and Dr. Hachiro Yuasa (the honorary president of International Christian University and the ex-president of Doshisha University: he passed away in 1981) was inducted as a chairman. Immediately after establishment, an office was established on Research Institute for Production Development. He started to build a student house. On July 14th, 1964, the student house was designed and constructed by Takenaka Corporation with cordial help of Mr. Toemon Takemura, before raising fund of 40,000,000 yen. The construction was completed on May 31st, 1965, so a dedication ceremony was held　with　blesses from cordial nationals and foreigners , especially to welcome Dr. Kohler and Dr. Hellstern from Switzerland on July 14th, 1965.